One day I unlocked the mystery of happiness. I remember being provoked and my endurance stressed beyond any human self-control mechanism but instead of flaring up, I actually started smiling to myself and chuckling. It didn’t make sense at first why I was smiling. In fact I didn’t even know. But after some time a consciousness awoke in me. I knew I was hurt but despite being hurt I was still happy. It was like I was overwhelmed with a sensation of inner bliss, satisfaction, a feeling of fulfillment; an endless tickle that sent currents running through my veins. Yes, I did smile, I was happy because I chose to be, and that was when I realized that happiness comes from within. You don’t have to search anywhere for happiness, all you ever need to do is to look inside you. Within you are sparks of excitement, like a hormone. It is like a gland in your blood that can be triggered off by external agents. The good news is it doesn’t rely wholly on external agents; it can be triggered off internally. This (I’d like to refer to it as a hormone) is what makes you see the world differently. It is what gives your heart a leap. It brings refreshing ambiance to you. It lets off your worries and makes you strong in the face of adversity. It is what brews confidence inside you. It keeps you bold and shining. It gives your life a meaning. It fills your whole being with stirring passion that you can reach for the skies. It helps you understand life better and deal with difficult situations. It is what helps you find beauty in everything around you. It makes life less complicated than it really is to you. You just need to fan those little sparks to flames of happiness. It is right within you. Come on, you’ve got every reason to be happy. Look around you, I’ll bet you find, in all the chaos, turbulence, problems and bad conditions that might fill your life, you’ll see hope, something to live for, something to keep you going. You don’t need to be wealthy to be happy. No! Believe me a pauper who is happy is better than a rich man who doesn’t know the secret of happiness. Do not allow people, problems and circumstances dictate to you when, where and why to be happy. Appreciate life! Be grateful! Be thankful! Make yourself a fountain of happiness and happiness will never depart from your abode. A giver never lacks what he gives. 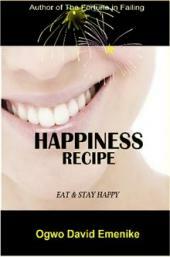 Let’s cook happiness!